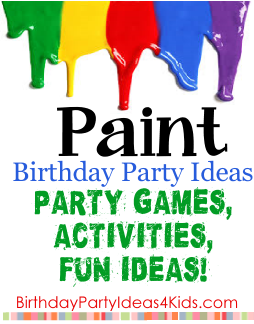 A Paint Party is a unique party idea that your birthday kiddo and his/her guests will not forget! Even if your child is not the next Picasso, he/she will have fun creating masterpieces with their friends. This painting party theme is great for all age groups and is sure to be a hit. Take multiple sheets of colored construction paper and cut into long 2 inch strips. Make the first strip into circle and secure with tape. Take the next strip and make a circle through the first one, so that the two are linked together. Continue doing this until you have a long garland to hang as a decoration! This would be even more striking if you did multiple strands of this garland with each strand being only 1 color. Take 2 large paint swatches (can be found at any store that sells paint) and glue 3 sides together to create a pocket. Use these to hold silverware for the party guests. Put a sign on the door inviting all the birthday guests to enter your child’s art studio. Buy cardstock in multiple colors. Cut several 3 inch circles out of each color and sew onto thick string to make colorful polka dot bunting! This could also be done with the paint chip swatches that you find at the paint store. Use white butcher paper as a tablecloth to protect the tables and also give it an artist feel. You could also splatter paint the tablecloth beforehand to add some more color. Blow up colorful balloons and attach to the wall in rows of single colors, like a watercolor paint tin. This would be a great backdrop for photos or the food table, or just as a statement wall. You could achieve the same effect by using colorful streamers that twist as they go down the wall. Use empty paint cans with the labels taken off as decorations. You could have colored tissue paper coming out of the top, or have the can tipped on its side with colorful streamers coming out. These could double as a goody bag for when the guests leave. Create a paint palette for a unique invitation! Start by cutting a palette shape out of brown paper. Next, cut small ‘blobs’ out of colored pieces of paper. Glue the ‘blobs’ onto the palette to look like paint. Write one piece of party information in each of the paint blobs. For a cheap invitation idea, glue a colored piece of paper onto the back of a paint swatch. On the color swatch side, tell the guests they are invited to the party or ask if they think they could be the next Picasso (or other famous artist). On the back, give all the party information. On one side of the invitation, write ‘___(birthday kiddo)___ is turning __(age)__, come paint with me!’ and include all of the information on the back. For this take on pin the tail on the donkey, print out a picture of a giant paintbrush. One at a time, blindfold the child and give him/her a paintbrush with a different color. The object of the game is to get your paint as close as you can to the end of the paintbrush on the paper. Whoever is the closest wins! Either buy a twister board or make your own from a white sheet. Last person standing wins! This would work well with younger kids. Give each child a few paint swatches and have them find things outside that match each color. Examples of this are grass for a green swatch, dirt for a brown swatch, a flower for a pink swatch, etc. Give each child an egg filled with a different color of paint. Have them stand 10-15 feet away from a target and throw it. The guest closest to the center wins! When the guests arrive at the party, have them dip their hand in paint and put their handprint on a canvas. Have them sign their name for a unique record of everyone at the party. Hang a giant canvas or white sheet outside. Empty out egg shells and fill with different colors of paint. Let each guest throw the egg shells to create a unique group painting. If the guests are too young to throw accurately, you can also fill water bottles with watered down paint and let them spray the painting instead. Have each kid create their own masterpiece! Supply the guests with a small canvas and paints and let their imaginations run wild. This could also be done with a blank white t-shirt or pillowcase. Supply each child with their own wooden initial and provide paints for them to decorate it. This doubles as a great party favor! If you are celebrating a preteen/teenager and the guests don't mind getting messy, have everyone come in white clothing that they can get dirty. Supply eggs shells filled with paint, watered down paint in water bottles, squeeze bottles filled with paint, and/or free standing buckets of paint. Stand back, announce a paint war, and watch as the birthday guests make themselves into standing masterpieces! To help them clean off when they are finished, you could provide a slip and slide, water guns, or some other sort of fun water activity. Have some fun with sidewalk chalk! Use our Sidewalk Chalk Games and Activities for ideas! Buy bags of M&Ms and separate out into the different colors. Put the different colors into jars or bowls and display on the food table for a fun treat! For dessert, give each child a cupcake with white frosting. Supply them with a palette of candy decorating options for them to create on their own. This could also be done with ice cream in a bowl, or with cool whip and fruit. Mix up some colored frosting or melted white chocolate with food coloring. Dip graham crackers, marshmallows, krispie treats, pretzel rods, or any other finger food into the color and let dry. Put a lollipop stick into the top for a cute painted snack option! Colorful nonpareils added before the treat dries would take this idea to the next level. Make punch/juice and label it as ‘creative juice’ and offer giant colorful lollipops as ‘color wheels’. Make cake pops and use cheap colored paintbrushes as the sticks. Make sandwiches and cut into a splatter shape using a cookie cutter (a flower shape should do the trick). Put up a sign announcing them as ‘splatter sandwiches’. Fill containers with candy, one color per container. Give each guest a bag and let them take a little of each home. Buy little watercolor tins and attach a paper that thanks each guest for coming onto the back. Give each child rows of dots candy. Take a plain white gift bag and have the birthday kiddo cover it either in painted dots or an abstract creation. Fill each bag with a different color of tissue paper and you have an easy goodie bag! Ask a family member or friend to help with a face painting station For an older child’s birthday party, do a step-by-step lesson on how to paint a particular picture onto provided canvases.